Banteay Srey is not a large temple and it is located some twenty miles from Angkor Thom, but it is worth the journey because its decoration is unique. Banteay Srey was built in 968 at the initiative of Brahman Jaynavaraha, the preceptor of King Jayavarman V, with the aim of portraying on its walls scenes from the Hindu mythology and its main epics. It was dedicated to Shiva. Three temples and two libraries stand on a small well preserved platform: unlike other monuments of Angkor they have not been too much damaged by the growth of trees. In addition their decoration was cut into a stone which proved more durable than that employed elsewhere; this eased the task of the archaeologists in reassembling the fallen parts. Gandhara is the historic name of a region in today's northern Pakistan. It was located on the land trade route linking India with the Middle East and the Mediterranean. It was invaded by Alexander the Great in the IVth century BC and eventually an Indo-Greek kingdom ruled over the region. 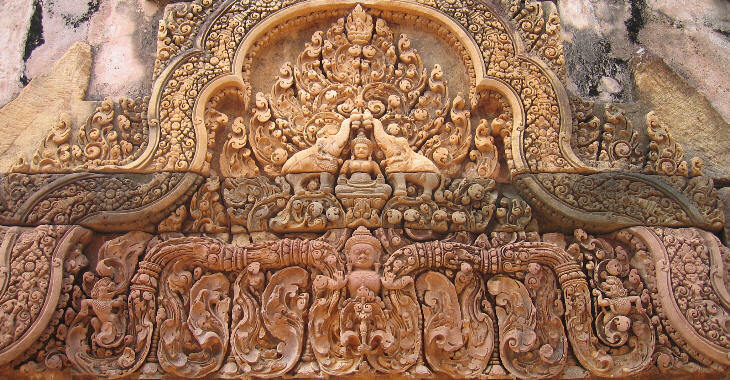 This event increased the contacts Gandhara had with the West; in the following centuries the art which developed there had elements of the Greek, Persian and Indian tradition: an echo of that art can be found in the acanthus leaves decoration of Banteay Srey and in other aspects of its works of art. The carvings are very elaborate, with small figures almost hidden in a maze of curved lines, but symmetry supports the overall design of the decoration. Notwithstanding the curved lines which frame it, the high-relief portraying the fight between Vali and Sugreeva could have well been placed on the tympanum of a Greek temple as it followed the triangular scheme of Classic art. The two princes fight at the centre of the scene, while Rama (an incarnation of Vishnu) is portrayed to the right of the fighters: he is shown both sitting and while driving an arrow through the heart of Vali. In order to fill the right angle of the pediment Rama flexes his knees. Vali is shown again to the left of the fighters while he is dying in the arms of his wife: in this way the couple fills the left angle of the pediment. (left) The slaughter at the Khandava forest; (right) an elephant used as a decorative motif. In other pediments the scene is more complex: the slaughter at the Khandava Forest is a story of the Mahabharata, a major epic of ancient India, which sees the involvement of several gods and heroes. For this reason the artist who carved the stones made use of a very low relief, a sort of drawing on stone. Elephants are portrayed in many reliefs, sometimes in a mere decorative function which reminds the viewer of Expressionist art. The use of high-reliefs and the graceful posture of devata and dvarapala are other elements showing the heritage of Gandhara in early Khmer art.